But a lot more cinematic. 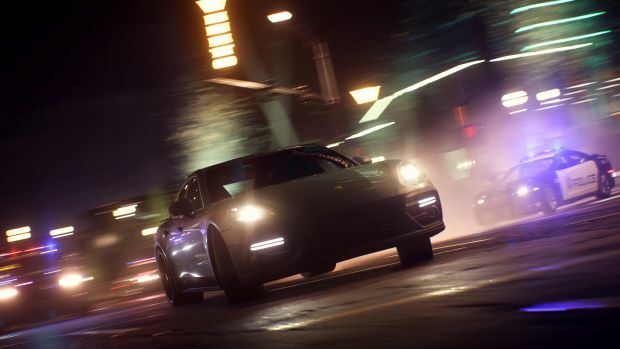 Ghost Games’ Need for Speed Payback made an appearance at EA Play and we got a look at a high-speed heist involving the three playable characters – Tyler, Mac and Jess. The mission itself sees them taking down enforcers for The House, the big cartel in Fortune City, and jacking a vehicle. The actual crashes seem to evoke Burnout, Criterion Games’ classic franchise, though there’s still a heavy emphasis on cinematic scenes. Jess trying to hop from one vehicle to another is one such example. Overall, the game looks a lot more impressive than the initial reveal trailer. Whether the full game’s story and open world lives up to that same level of quality remains to be seen. Need for Speed Payback will be out on November 10th for Xbox One, PS4 and PC. What are your thoughts on the trailer? Let us know in the comments below and stay tuned for more information as EA Play progresses.